Seeks to extend the due date for furnishing FORM GSTR-1 for taxpayers having aggregate turnover more than Rs. 1.5 crores for the month of March, 2019 from 11.04.2019 to 13.04.2019. Seeks to extend the due date for furnishing FORM GSTR-7 for the month of March, 2019 from 10.04.2019 to 12.04.2019.
Review of progress of implementation of Scheme of Budgetary Support to eligible industrial units located in States of Jammu and Kashmir, Uttarakhand, Himachal Pradesh, and North East including Sikkim-Clarifications. Seeks to bring into force the CGST (Amendment) Act, 2018. Seeks to amend the CGST Rules, 2017. Seeks to amend notification No. 2/2017-Central Tax dated 19.06.2017 so as to define jurisdiction of Joint Commissioner (Appeals). Seeks to amend notification No. 65/2017-Central Tax dated 15.11.2017 in view of bringing into effect the amendments (to align Special Category States with the explanation in section 22 of CGST Act, 2017) in the GST Acts. Seeks to rescind notification No. 8/2017-Union Territory Tax (Rate) dated 28.06.2017 in view of bringing into effect the amendments (regarding RCM on supplies by unregistered persons) in the GST Acts. Seeks to bring into force the UTGST (Amendment) Act, 2018. Seeks to bring into force the GST (Compensation to States) Amendment Act, 2018. Seeks to amend notification No. 48/2017 to amend the meaning of Advance Authorisation. 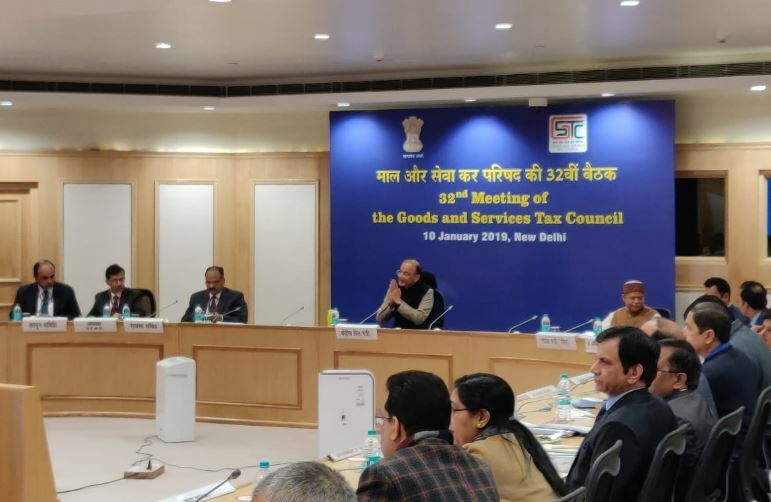 The GST Council has in the meeting held on January 10, 2019 increased the threshold for registration, enhanced turnover limit for composition and recommended composition scheme for service providers. Service providers and those rendering mixed supplies of goods and services with a turnover up to Rs. 50 lakh can opt for composition scheme. The composition rate for service providers shall be 6%. Taxable persons opting for composition scheme to file one annual return. However tax is to be paid quarterly. Effective April 1, 2019, the threshold exemption is enhanced to annual turnover of Rs. 40 lakh from Rs.20 lakhs. In special category States where the present threshold is the annual turnover of Rs. 10 lakhs is enhanced to Rs. 20 lakhs. The threshold applies only to taxable persons who do not effect inter-state supply. The States will have the discretion to opt up or opt down the exemption limit. They will have to inform the Secretariat within a week if they wish changes in their exemption limit. State of Kerala allowed to impose maximum 1 per cent cess on intra-state supply of Goods and Services for a period of upto 2 years. Central Goods and Services Tax (Amendment) Act, 2018- Clarification regarding section 140(1) of the CGST Act, 2017-reg. Fourteenth amendment to the CGST Rules, 2017. Seeks to amend notification No. 2/2017 - Central Taxes dated 19.06.2017. Seeks to insert explanation in an item in notification No. 11/2017 � Union Territory Tax (Rate) by exercising powers conferred under section 11(3) of CGST Act, 2017. Seeks to extend the due date for furnishing the statement in FORM GSTR-8 by e-commerce companies for the months of October to December, 2018 till 31.01.2019. Guidelines for processing of applications for financial assistance under the Central Sector Scheme named �Seva Bhoj Yojna� of the Ministry of Culture � Reg. NACIN,Bengaluru: Swachhta & Sustainability in Thought, Words & Action. 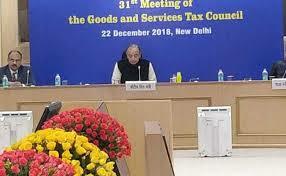 The GST Council has in the meeting held on December 22, 2018 reduced / rationalized the rate of tax on certain goods and services and recommended certain changes in policy / procedures. The GST Council approved revision of rates on several commodities. Pulleys, transmission shafts and cranks, gear boxes etc., falling under HS Code 8483. Monitors and TVs of upto screen size of 32 inches. Parts and accessories for the carriages for disabled persons. 70% of the gross value shall be deemed as the value of supply of said goods attracting 5% rate and the remaining portion (30%) of the aggregate value of such EPC contract shall be deemed as the value of supply of taxable service attracting standard GST rate. A single cash ledger for each tax head. The modalities for implementation would be finalised in consultation with GSTN and the Accounting authorities. Single authority for disbursement of the refund amount sanctioned by either the Centre or the State tax authorities would be implemented on pilot basis. The due date for the taxpayers who did not file the complete FORM GST REG-26 but received only a Provisional ID (PID) till 31.12.2017 for furnishing the requisite details to the jurisdictional nodal officer shall be extended till 31.01.2019. Also, the due date for furnishing FORM GSTR-3B and FORM GSTR-1 for the period July, 2017 to February, 2019/quarters July, 2017 to December, 2018 by such taxpayers shall be extended till 31.03.2019. Creation of a Centralised Appellate Authority for Advance Ruling (AAAR) to deal With cases of conflicting decisions by two or more State Appellate Advance Ruling Authorities on the same issue. The due date for filing of Annual Return in Form GSTR-9, 9-A (for Composition dealers) and audit report in Form GSTR-9C has been extended till 31/03/2019 vide press release dated 07/12/2018. The requisite FORMs shall be made available on the GST common portal shortly. Formal Notification / Orders is being issued. Seeks to extend the due date for filing of FORM GSTR � 7 for the months of October, 2018 to December, 2018.